Your search for a spacious, cozy, year-round vacation cabin in Minocqua is over! It’s time to make some family vacation memories at our Northern Memories cabin. Bring your boat, because this cabin comes with a boat slip too. Inside is furniture for large family gatherings - everyone can enjoy a movie or talk about their vacation stories together. Your home away from home has a gas fireplace, large sun-room, lots of storage and closet space for winter gear, large dining room table, and the kitchen is fully stocked with everything you need to cook meals. But, if you want to skip some time in the kitchen, Minocqua pubs and supper clubs are just across the lake. Sleeping arrangement: 1 Single, 1 Double, 1 Queen, 1 King. 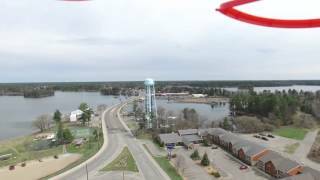 Lake Minocqua is just a quick walk away and the spectacular views of Lake Minocqua and downtown Minocqua will make a lasting impression. Our beach will make a lasting impression on all ages - we have the only sandy, private, walk up beach on Lake Minocqua. Guests often enjoy their cabin time evenings gathered around the campfire making smores and roasting hotdogs. Making Northern Memories is easy at the resort! The Minocqua area averages around 111" of snowfall every winter. 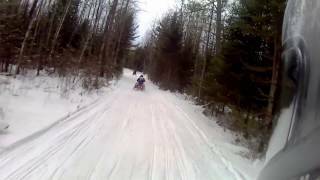 The most beautiful snowmobiling trails in the Northwoods are accessible from the resort. In fact, you don’t need a car at all. Groomed trails take you from deep in the woods to downtown Minocqua. Now that’s a unique way to “go out for dinner”. You’re surrounded by tall Northern Pines and your boat is already in the water. Now that’s a real Northwoods retreat. Prefer to spend your days off the water? Our Nitschke’s Northern Resort is adjacent to the Bear Skin Trail, so you can step out the front door and hop on the 18-mile trail suitable for biking, hiking and even snowmobiling. With year round events and festivals, your kids won’t ever say ”I’m bored”. Sledding is a favorite pasttime for the kids who visit our resort over Christmas break. During summer, head to the eastern lawn and watch the Min-Aqua Bats perform a ski show. There’s horseshoes, water skiing, volleyball nets, jet skiing, tubing. Kids love jumping off the large floating dock again-and-again. Get your group together and your inquiry in quickly. Our Northern Memories cabin won’t stay vacant for long. Pontoon rentals available. A great way to spend a warm day on the water. Minimum nights: 3. Maximum nights: 14. Half of the base rental amount in advance. The remaining half plus all taxes, fees and additional deposits are due and payable prior to occupancy. Overnight visitors are considered guest and are subject to additional occupancy charges.